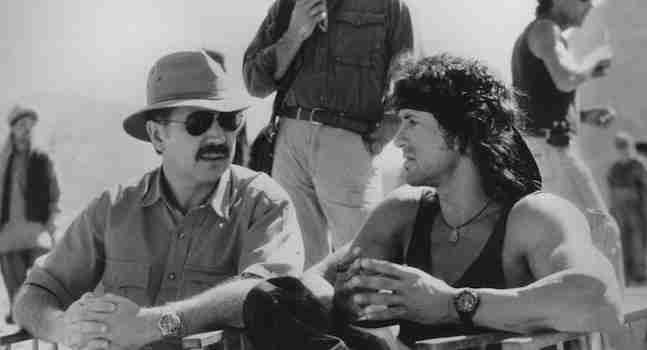 The new 4K release of First Blood, Rambo: First Blood Part II and Rambo III afforded me the tremendous opportunity of chatting with author David Morrell. Morrell’s 1972 novel, First Blood introduced the world to Rambo and ten years later the film adaptation starring Sylvester Stallone became a huge hit, spawning four sequels. Morrell’s novel is a tense, beautifully constructed character-driven action piece which hasn’t aged a day since it hit shelves 46 years ago. It shares many similarities with the Stallone film, but it is a very, very different beast in which the Sheriff (played by Brian Dennehey in the film) gets as much coverage as Rambo. David Morrell gave tremendous insight into his writing process and the creation and development of the Rambo character (Morrell wrote the novelisations for Rambo II and III). He’s an incredibly thoughtful man, who delivers wonderfully detailed responses to questions. It was a joy to listen to him talk about his creation. First Blood and Rambo were very much part of the Reagan era. I know Sylvester Stallone is currently working on Rambo 5. Do you see parallels between America then and now? I can’t tell you about the fifth film. When Carolco Pictures made the first three Rambo films I had a very close relationship with them and they consulted with me as the movies were made. But there have been a number of studios since then and the current studio doesn’t tell me what’s going on and I can’t comment on the fifth film. Do you find it odd that you’re still taking about First Blood and Rambo almost fifty years after you wrote the book? I could not have imagined. I started writing the book when I was 25 or 26 and it took me three years to write and I was learning how to write a novel. It was my first and there were times when I wasn’t sure I could finish. The ultimate goal that I was aiming for was an action novel which didn’t feel like a genre novel. I wanted the characters to feel real. I think that’s why it took me so long, I didn’t want to take shortcuts. There are all sort of cliches in action movies like “gun smoke filled the air’’ and “a shot rang out’ – that kind of stuff. I didn’t want to go in that direction at all. I wanted to try a new way to write action. So, it took me a long time. In 1972 when the novel was published, there were not many thrillers on the best-seller list. It’s really instructive to got back and look at our country, the United States, the New York Times had best-sellers. I always thought the odds were against it and was surprised that every important journal and magazine reviewed it. It was very, very exciting but the fact that it took ten years for the film to get made, made me wonder if it would ever get made. Time moved on and I have been fortunate in a way that few novelists have been, to have a character that is known around the world and has been known for all these decades. Obviously you spent so much time writing First Blood and now the book and the character have been embraced by so many people around the world. Do you still have a personal attachment to it? Well, it’s become a family joke and among my friends when I’m introduced, people call me ‘Rambo’s Daddy’ or ‘Rambo’s Father’ and it always gets a laugh. It’s fun but there’s a truth in it. When you look at the films in an objective way; at first we have my novel First Blood in which the character is furious, a bitter furious man because of what he learned about himself in wartime and in combat. When you look at the film adaptation, the character is not bitter or angry, he’s in his own way, at the start of the film sorrowful. He’s a victim. If you look at the second film, all of a sudden his jingoistic and he’s almost a recruitment poster for the military. The same with the third film. If you look at the fourth film, the character is different again and Sylvester told me when he was making the fourth film, that in retrospect he wasn’t happy with the second and third films because they glorified the violence. He thought the fourth film should go back to the bitterness and anger that my character in the novel had. To off-set that the violence was being glorified, he would make the film as if Sam Peckinpah had made it. We have all these different Rambos. So, I think of myself as having given birth to a character who grew up and in a way went off in all different kinds of directions. Yes, it’s kind of an allegory. The man who trained him kills him in the end. The whole point is that the system who created Rambo destroys him. I thought of Rambo being disaffected by the war and angered by it and he was almost the equivalent of demonstrators against the war in the 1960s and the police officer would represent the other side. But I never had any politics in it. I think one reason the book is still in print after 46 years is that I focused on the story and on the characters and I let readers make their own conclusions of what these different characters meant. If he had of lived, would you have gone in the same direction as the films? In the novel he needs to die. There’s no question about it – that’s the way it’s set up. In the original version of the film that was tested on audiences Rambo died and audiences were very upset. There are interviews with people like Richard Crenna, who said they were ready to run after the director, saying “how could you kill this guy?”. So, the producers who had not planned to make a sequel said “we’d better change the ending”. They went back to Canada, where it was filmed, in British Columbia and they shot a new ending still not thinking that they had enough for a sequel. But the film was so successful, it’s just amazing to think of how successful it was, that they said “oh my heavens, we can make sequels now”. From their point of view it was a happy accident. My contract…I’m the only person who can write novels about Rambo. The company approached me and asked if I would do a novelisation and my inclination was not to. They were popular in the 1980s and before home-video the only way to experience the film that you enjoyed was to read the novelisation and then imagine the movie you saw. Carolco Pictures came to me and asked me and I said no initially. Then as I thought about it and I saw the script, I thought there are things where which are pretty interesting that the movie doesn’t go anywhere near. The lot of Rambo: First Blood Part II requires Rambo to go back to the prison camp from which he escaped in Vietnam. This is mentioned very casually and there’s no emotional connection at all with the character, He might was well have been visiting anywhere. I thought this is interesting – I could write a book in which he goes back. I was in a conundrum because I killed Rambo in the novel and now he’s alive. I had to put a little note in the beginning of the book saying that I was aware of the difference but movies are movies and novels are novels. This wouldn’t be a transcription of the script – it would be a legitimate book. In addition, there was an unused script by James Cameron of Terminator fame and he had a wonderful dark, dire opening of Rambo in the basement of a military asylum with the lights out and the guards think he’s the Prince of Darkness. I thought this is too good to let go so, with credit I used the beginning of James Cameron’s screenplay. I put in about one third script, one third James Cameron and one third me. There had never been a novelisation like it and it was six weeks on the New York Times list. Again a kind of happy accident. It turned out really well. Did you find it difficult to distill someone else’s vision and add your own into the mix as well? I did it the other way. I said this is my character and I can do anything that I want. I had the advantage of being the only person who could write the novelisation by contract. Normally these books are automatic typing. You just type the dialogue and write give description of the way the character looks and describe the action. A script is what,100 pages? And you try to turn it into 300 pages. It’s all fluff in many cases but in this case, because I had a power that novelisers don’t have, I could treat it as my creation. So, I put in all sorts of things that were in-line with my novel, First Blood. The same thing applied in Rambo III. In this case I got to thinking, it’s Rambo in Afghanistan with the Russians. If you think about it Afghanistan is Russia’s Vietnam. So I invented a character opposite Rambo, who’s a Russian who feels about the Afghan war the way Rambo came to feel about the Vietnamese war. I think probably half the novelisation for Rambo III is brand new. It’s nothing like the movie at all. It was really interesting to work with the character again and give the interpretation that I gave to them. Check back soon for the second part of my interview with David Morrell. The Rambo Trilogy is now available ON 4K ULTRA HD, BLU-RAY AND DIGITAL DOWNLOAD.